Kids' Book Review: Review: Did you take the B from my _ook? 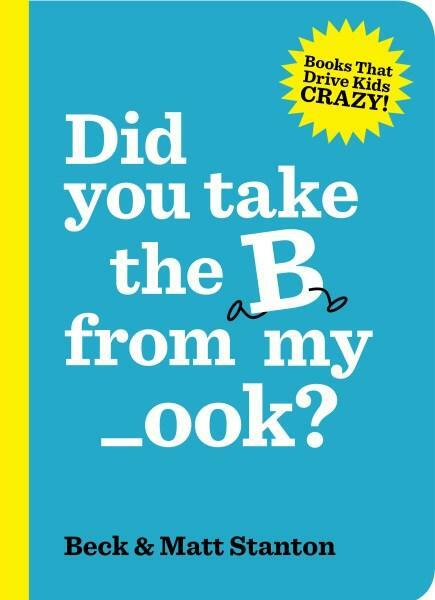 Review: Did you take the B from my _ook? Beck and Matt are _ack! Thank goodness! I was losing my insanity and was desperate to be driven crazy once again. So relieved. And it's all thanks to Did you take the B from my _book? The (absolutely craaaazeeee) narrator of this _ook has lots of favourite things. They all _egin with the letter B. Bats. Beaches. Bread. Bushes. Bulldozers. But uh-oh. The narrator seems to be getting a cold. ACHOOO! Okay, where were we? Oh yes, we were listening to the narrator list their favourite things, starting with the letter B. They also like to kick their _all. Hmmm. Seems something is missing. That pesky letter B. Where has it gone? This is one of those books that you really must see to 'get'. Reviewing it is like knitting with water--the cleverness, fun and humour is so endemic to the overall storyline, it can't be pinned let alone knitted. So best get yourself the book, settle in with a gaggle of kids and make them riproar with laughter. So much fun, fa_ulous word-play, _rilliant humour and interactivity, stacks of silly. And really cool _ook design, to _oot. Another modern classic, don't keep me waiting for the next _ook, Beck and Matt! Title: Did you take the B from my _ook?